The Cipriani – of all the hotels in Venice – is probably the best placed to give its visitors privacy. And privacy is important for those of the Great and the Good who stay in its gilded chambers. For the Cipriani enjoys a privileged position on the Giudecca, a five minute ride (and a whole planetary system) away from the crowds which mill around the Basilica of San Marco. The hotel, of course, has its own very smart launch to transport guests to and from St Mark’s Square, and it is a particular joy to be able so easily to venture into and to retreat from the throbbing centre of La Serenissima. There is an old saying, is there not, about having the best of both worlds? 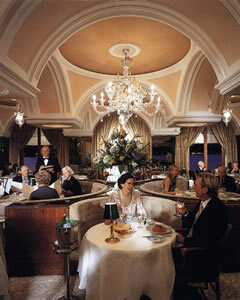 It applies with rich abundance to this grand and famous hotel. 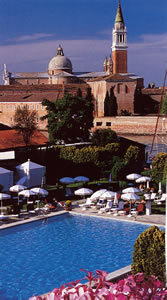 I must mention at once the Cipriani’s swimming pool. I cannot tell you about those I spotted there – like The Cipriani itself, I am the soul of discretion – but I can mention its size. In a city in which hotels simply do not have swimming pools, this vast rectangle of blue water is astonishing. Its length is just a couple of feet short of that required by Olympians. Why is it so big? The story goes that the architect who designed it was English. He put down the dimensions in feet; but the Italian builders naturally supposed that the figures referred to metres… Thus did The Cipriani acquire one of its chief assets. 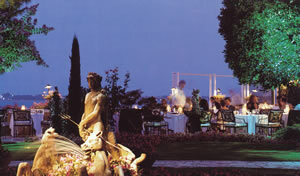 This monument to watery hedonism sits amidst plush gardens, for which the word ‘manicured’ might have been invented. Among these acres – and remember, gardens (like swimming pools) are not exactly half-a-dozen-to-the-euro in Venice – are tennis courts and the pathway to the two annexes. Actually, these ‘annexes’ are exquisitely restored palaces, called the Palazzo Vendramin and the Palazzetto – which look directly across the water towards the Doge’s Palace. Many years ago I stayed in one of these palaces, but on this visit I was billeted in the main building. But before I was shown upstairs, I spied an old friend. 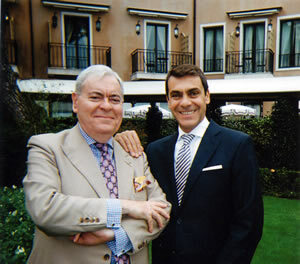 Giampaolo Ottazzi is the General Manager here. He was, as always, beautifully turned out – as I hope you can tell from the photograph which I had taken of the two of us. I also present to you a reproduction of the painted portrait of this charming and efficient gentleman. After my happy conversation with Mr Ottazzi I went up room 205. 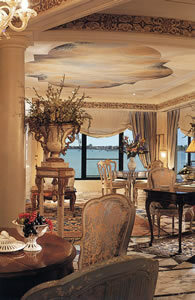 This was a suite, with a balcony and a view of the Lagoon. (The nightly rate for this light, airy and charming apartment was 3,000€ a night.) Its colour scheme incorporated cream, beige, salmon pink and brown (the last from the highly polished wooden floor). Mirrors were used effectively and the lighting – from table lamps and wall lights – was restful and flattering. (At my age, I need the lighting to be flattering.) The entrance hall, with the mini-bar, opened into an elegant sitting room, with a Persian carpet, wooden chairs in the Gothic style, a sofa upholstered in silver damask, a marble-topped breakfast table and a writing desk. Attached to the television was a dvd player, on which I was able to coax my cds into giving me my daily helping of Sir Edward Elgar’s lush melodies. Through the French window, I could sit on my balcony and gaze at the monastery of San Giorgio Maggiore. Two sets of mirrored double doors gave access to the bedroom. Here much aesthetic interest was provided by an antique chest of drawers in the ‘bombe’ shape. The bed had been made delightfully soft for me. And there, through my second French window, was the view I had enjoyed from my first. In the bathroom I found much brown marble, a large tub, two wash basins, plenty of hanging space, a separate shower and a separate loo. Truly, this was a most comfortable billet. It was a temptation to stay in this lovely suite each morning for my early comestibles. But I am glad I did not, for breakfast in the dining room is a grand occasion (and even grander when the weather permits the fast to be broken on the restaurant’s terrace). I sat at a round table with a white tablecloth and secured, from the buffet, orange juice, cold roast beef, croissants, mango, pineapple, strawberries and melon – all of the highest quality. And to me was brought, on a silver salver, sautéed sole, which was boned and plated next to my table. It was delicious. This was at the Restaurant Fortuny. 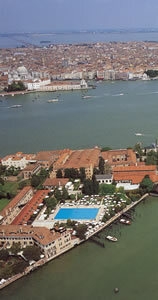 The hotel has another dining room – Cip’s, with its terrace looking over the water to St Mark’s – but I confined my attentions in the morning and in the evening to the Fortuny. Here Chef de Cuisine Renato Piccolotto offers food for dinner which is deeply satisfying. There is nothing here to frighten the horses, and nor should there be. 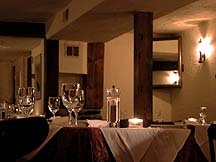 Chef Piccolotto takes ingredients of the best sort and fashions them with considerable skill into dishes which appeal to his sophisticated and experienced clientele. 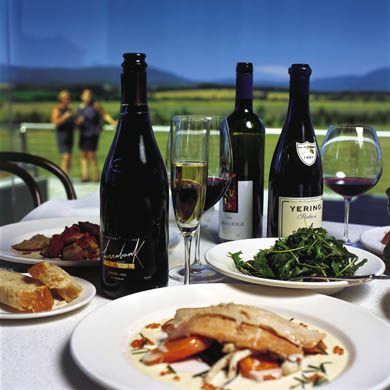 The wine list has 536 offerings and divides its bottles into types – “light and crisp white wines” and so on. (The older vintages are in the “great wines and unique vintages” section, which gives Mr Parker’s scores and comments for each wine.) It is good to see not only grapes given, but also alcohol percentages. Prices range from 47€ for a 2011 red from the Veneto to 11,000€ for the 2002 Romanée-Conti. Other bottles to catch my eye were: 1999 Latour (950€), 2005 Margaux (950€), 2005 Tignanello (413€), 1988 Solaia (900€) and 1997 Masseto (2,500€). Sommelier Sebastian Betolian brought to me a well-balanced Italian bubbly (Franciacorta, Bellavista – 79€) and a rich, dense and typically heavy Amarone, laden with black fruit (Valpolicella Classico, Trabucchi, 2006 – 126€). My privacy was preserved at the Cipriani. Indeed, my entire stay provided a model for how one should be treated at a luxury hotel: with discretion, courtesy, efficiency and friendliness. Thank you, all my friends at The Cipriani, for a wonderful visit. 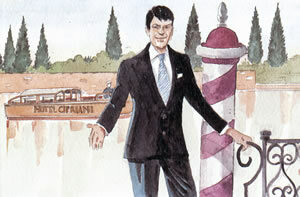 The fame of The Cipriani is world-wide and entirely merited. The Most Serene Republic continues to be served impeccably by its Most Serene Hotel. Isola della Giudecca 10, 30133 Venice, Italy.